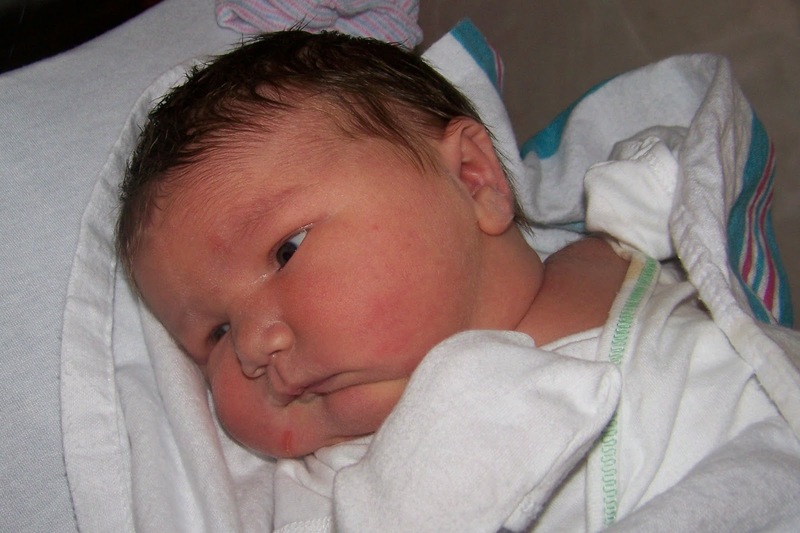 So after delivering Jillian via C-section, I was in the hospital for two-and-a-half days before being released. Considering I was hospitalized for five days for my vaginal delivery with Jena, I think half that time for a C-section is pretty awesome. I had a few issues in the hospital, minor I suppose. And I have no frame of reference since it was my first C-section, so maybe they're all common. First of all, when they removed my catheter, it was excruciatingly painful to urinate. We're talking a 10 out of 10 on the pain scale. We're talking me sobbing on the toilet. And keep in mind that at this point I'm still on pretty good pain meds. But seriously, 10 out of 10. Horrible. That took a little while to improve, and by the time I went home it was no longer painful, but was still uncomfortable to pee. But within a few more days, all was back to normal on the pee front. Lastly, I was having horrible abdominal pain, even on the pain meds. But, you know, only when I moved. But when I moved? Easily ranged from an 8 to 10 on the pain scale. Ouch! And not at my incision site. What was frustrating to me about this is that I was told repeatedly that if I had abdominal pain not at the incision site, I needed to let them know immediately. But when I did, I was told it was probably just from my uterus shrinking back to normal size and was nothing to worry about. So is it serious or not? Seemed to be conflicting info. Hmph. Then on my second day home I was seen at home by a nurse. She took out my staples and did a general check up. During the check up she again mentioned that if I experienced any abdominal pain not at the incision site, I needed to let them know. So I told her I was still having horrible abdominal pain and was nearly out of my Vicodin. She assured me that it was probably 'normal', and advised me to call my doctor for a refill. So I called the office for a refill. The nurse asked me a bunch of questions, confirmed that I was still taking the max dosage of Vicodin, talked to the doctor, then called me back to tell me that the pain I was feeling was probably normal, they'd call in another two days worth of meds, but that was it, so I needed to begin weaning off of the meds immediately. Honestly, I felt like I was treated like a drug seeker. Keep in mind my abdominal pain is not at the incision site (my incision actually never caused me trouble), and when I moved certain ways, especially lying down or getting up, my pain was easily a 10 out of 10. It was excruciating. I attempted to wean off of the meds, but was still experiencing horrible pain, so two days later, I called and insisted on getting worked in to see the doctor. So glad I did. I have an infection in my uterus. He could actually see the redness thru the skin. I was put on antibiotics and given a stronger pain med and orders to come back three days later. A couple of days on the antibiotic and there was noticeable improvement. By the time I went back for my checkup, even the staff commented on how much better I looked. The doctor agreed that it seemed to be clearing up, ordered me to make sure I finished the antibiotic as prescribed, renewed my pain meds, and gave me orders to come back immediately if the pain, tenderness, or redness worsened at any point, or to come in if after I finished the antibiotic I was still experiencing any pain or tenderness at all, as by the time the antibiotic was finished the infection should be completely cleared up. Honestly, I'm not very hopeful. I've been weaning myself off the pain meds, and will run out tomorrow. Antibiotics run out in three days. Though it is much improved, I still have pain. At times up to a 3 or 4 on the pain scale. And I'm a little concerned at how bad it's gonna be after I'm off the pain meds completely. And how bad it's gonna be once I stop the antibiotics. Because I'm thinking if the infection's not completely gone by the time I stop the antibiotics, then the minute I stop them it's probably gonna flare back up again. I guess we'll just have to wait & see. So... because of the infection, I had "babysitters" round the clock for two weeks as I was both unable to perform routine menial tasks, was in near-constant pain, and there were health concerns. Though I'm super-grateful for everything they did, I am so glad to not have a house full of people constantly. This introvert needed time alone with her family. Seriously. So that's where we are now. Hopefully the anti-biotic will finish clearing up the infection over the next couple of days and we'll really start seeing an upswing in my recovery. Only time will tell. I'm sorry to hear about your infection and that you've been in such terrible pain. I took no narcotics at all after the first 24 hours with my c-section, so I imagine your pain must've been much worse than average. Please don't wait any longer to get back into see the doctor. It does not sound like it is clered up enough to be finished in 3 days. Go back before you are off the meds. If it flares up it will be harder to get it back under control. I don't mean to sound like an alarmist but having had female issues most of my life, I understand the frustration. It may be as simple as putting you on another round of the same stuff or something stronger.